Get your fitted paisley jacket fix done correctly when you get seen wearing fitted blazers with the Manzini name. You won't be able to find a better brand with style when it comes to jaw dropping stylish blazers for getting noticed in. 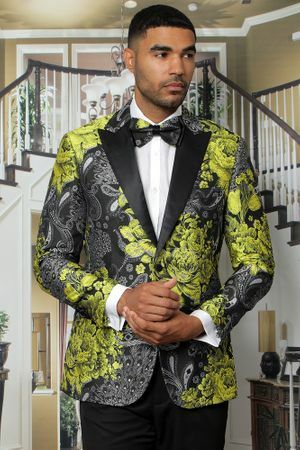 This gold and black floral pattern modern fit blazer has that entertainer look but can be worn for Proms or even to the club on a Friday night with jeans. It has side vents in the back for keeping you moving in style.